I have been living in Oregon for more than thirty-five years. My visual investigations have taken many forms, many different uses of materials and manners of interpretation. Among my various investigations none seems more mysterious and difficult to grasp than a vase of flowers. Looking at flowers has thus come to be a special source of visual inspiration. They evoke in me the magical and sentimental feelings about nature. The abundance of color and variety always amaze me. My quiet fascination seems to stimulate many aesthetic questions. How do the petals fold on one another? What abstractions of light might be caught through a clear vase holding stems and leaves? What is that particular light and color that envelope the background? What is it about a colorful bouquet that is so mesmerizing? 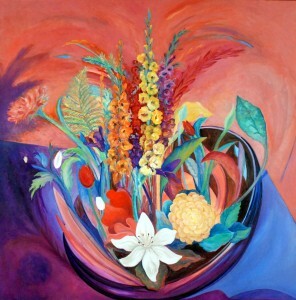 This group of paintings represents a selection of my pieces related to floral themes. Some were painted in traditional observational ways and some are just made up in the ethers of the creative process. I had a good time painting them, and always had a sense of the mysterious beauty of the flowers as I worked. It is part of what I wanted to convey.